With the Tomb Raider movie hitting theaters next week, publisher Square Enix is looking to promote the franchise. 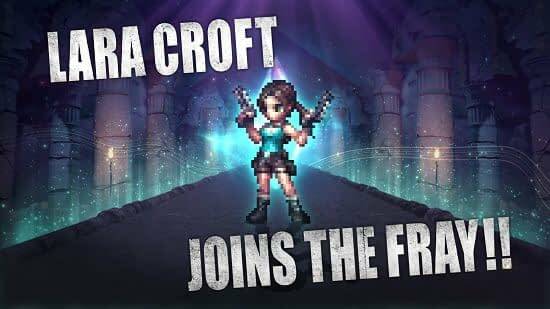 And, in a move that really shouldn’t come as a surprise, Final Fantasy Brave Exvius will be the home of a Tomb Raider collaboration event that will give players access to Lara Croft as a playable character. This is the first time a non-Final Fantasy character has made it into FFBE, but I’m certain we can take it as a sign of things to come. After all, FFBE is sort of like a TCG in that the concept boils down to one truth: the more characters available the better. The Tomb Raider crossover event will kick off on March 9th and run through March 22nd, so you’ve got a decent bit of time to unlock Lara. This version of Lara comes from Lara Croft and the Temple of Osiris rather than the 2013 reboot or 2015’s Rise of the Tomb Raider, which is an interesting choice in and of itself. To unlock Lara, you’ve got to complete the first event stage or collect daily login bonuses to get yourself the summon ticket. The new collaboration event will give players the opportunity to battle the Apep boss during the Lara Croft and the Temple of Osiris raid. Additionally, Final Fantasy Brave Exvius characters will be re-skinned based on characters from Lara Croft and the Temple of Osiris including Explorer Aileen, Divine Soleil, and Pharaoh Abe. The re-skinned FFBE heroes will available for a limited time through gacha summon pickups. Several new updates will be added to the game during the collaboration event as well. Beginning March 6th, new players can acquire the 5* max Level Ashe (Final Fantasy XII) from the tutorial gacha and pick up 5* Lightning (Final Fantasy XIII) as a reward through the Rookie Mission. FFBE is available as a free-to-play game on the App Store, Google Play and the Amazon App Store.